Marketing automation platforms like Act-On are powerful sets of tools that work just as their name suggests; they help marketing teams optimize and repeat various tasks and processes to both increase and identify candidates for conversion or sales. When all is said and done, these tools do a great deal to maximize the day-to-day for marketing professionals, but may leave sales experts wondering how they can better leverage the tool. In a previous story on the Simpleview blog, we shared how sales users in Act-On could set up custom web alerts and daily website visitor reports within the platform. After all, intelligence and reporting are a big part of having the right conversation with prospects to your destination. That being said, today’s sales experts are tech-savvy professionals capable of digging even deeper than reporting to research and communicate with potential customers. That’s where Act-On Anywhere comes into play. Act-On Anywhere: What Is it? Act-On Anywhere is an extension for the Google Chrome web browser. Once installed, it expands your functionality in Chrome and allows you to stay within your favorite websites and applications while still using marketing automation to create and optimize content, use email more effectively, and access more marketing engagement data to make better business decisions. 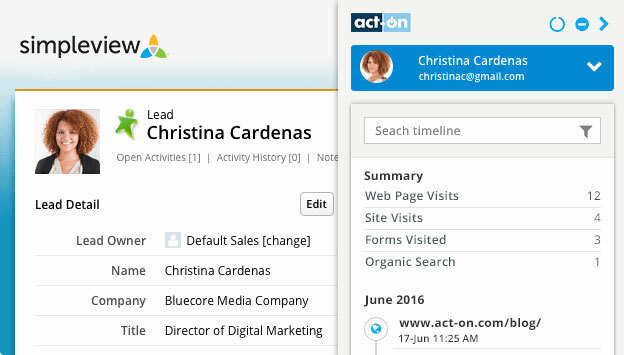 With Act-On anywhere, you can leverage your marketing team’s content, perform SEO audits on both your content and competitors&apos; content, and see the activity history for any person matching an email in your Act-On database. For example, you can log in to your Simpleview CRM and see the web and email activity history of a contact. Go to the Google Chrome Web Store from your Google Chrome Web Browser. The Act-On Anywhere extension page will display, click the blue Add to Chrome button in the upper right-hand corner. Confirm the new extension by clicking "Add." Once you click "Add", Act-On Anywhere will be added to Google Chrome. You will be redirected to the Account Management Dashboard, Click the + Account button and enter your Act-On user email address and password, and click save. 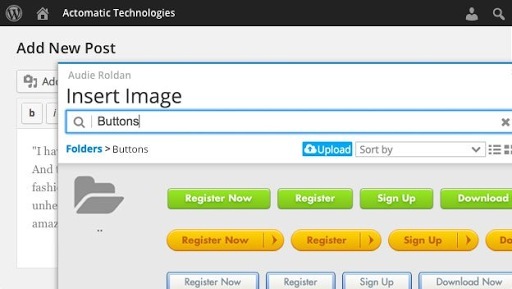 With this feature, you can use the Act-On Anywhere overlay to embed image assets, links or forms on any web-based social publishing platform, email client or CMS system. Pulling in multimedia and links from the Act-On media library into a post or comment is a great way to share your marketing data while contributing to an overall lead score. While more relevant to a marketing professional, the SEO audit tool can be helpful if you are also wearing a sales hat. With the extension, you can run SEO audits on any web page, on the fly, and get immediate access to action-oriented SEO reports. Pairing Act-On Anywhere with Simpleview CRM is an easy way to get an immediate view of a contact’s full engagement timeline, including website visits, emails opened, webinars attended, and assets downloaded. It is important to note that this information is only available if you have already unmasked visitors on your website, though. Utilizing the timeline tool is not just limited to Simpleview CRM. Prospecting on LinkedIn or on another website? Get that same engagement timeline for any contact you find online. 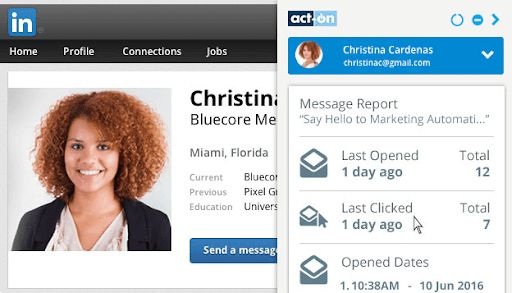 Act-On Anywhere searches for email addresses on the pages you browse, and pulls up an activity history showing any prior interaction they might have already had with your business. You’ll see everything from web page visits to email opens, and get a more complete picture of that prospect. In our honest opinion, this is the bread and butter of Act-On Anywhere. If you are using Gmail for day-to-day sales communications, this extension can really be a game changer. In addition to using the content assist feature to drop image assets, links, and forms directly into your drafts, you can also use the tool to optimize interactions in Gmail by using Act-On’s pre-built email templates (created by your marketing team) within the mail app. Even better, you can also opt-in your communications for tracking, and get alerted in the web browser when a prospect interacts with your email. This functionality is also available to you if you use the Outlook application on your computer, but will require you to do an extra installation. You can read more about installing this add-on here. Please note, however, that email tracking works in a one-to-one fashion. The message, including the trackable links, will be personalized for the first recipient in the "To" field. If there are additional recipients, or if the message is forwarded on, any additional opens and click-throughs will be attributed to the original recipient. For Sales, this will provide you with more intelligence on prospects and potential visitors to enhance communications and make a sale. For Marketing, it will help them track the behavior of prospects and customers across multiple platforms, and automate follow-up communications based on their current place within the conversion funnel. 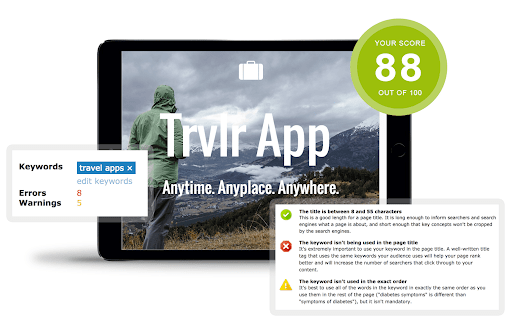 With the power of reporting and alerts combined with Act-On Anywhere’s content and intelligence, sales users will quickly come to find that there are more than enough tools at your disposal to have the right conversations, with the right visitors. 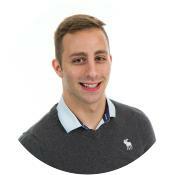 As a Digital Marketing Strategist at Simpleview, Nate Casimiro specializes in pairing content creation with marketing automation to create effective digital communications that result in lead generation.